Here are some of the more noteworthy things available in the Neon milestone build M5 which is now available for download. We also recommend to read the Tips and Tricks, either via Help > Tips and Tricks... or online for Platform, JDT, and PDE. 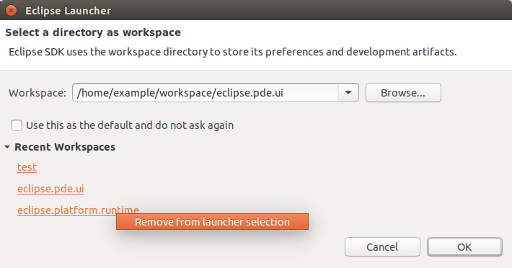 Directly start previously selected workspaces in the launcher The workspace selection dialog now allows you to start a previously selected workspace directly via a link. The path to the workspace is shortened. The full path is available if you hover over the link. You can remove existing entries via the context menu. Keep in mind that in any case, it's possible to assign an editor for an unassociated file type either via this same preference page, or via the Open With > Other... context-menu on the file. 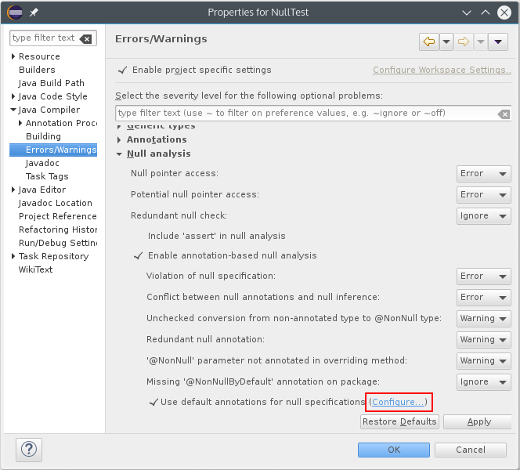 The implementation comes with a new extension-point org.eclipse.ui.ide.unknownEditorStrategy that allows external contributions of additional strategies. Note: Problems were found with the Ask via pop-up strategy. We'll fix them in M6. Improvements in the Mac default theme The look of the toolbar in the Mac default theme was adjusted to align with other Mac applications. Perspective names hidden by default To save space in the toolbar, the perspective switcher has been changed to show only the icons of perspectives by default. You can show the text again via the context menu. 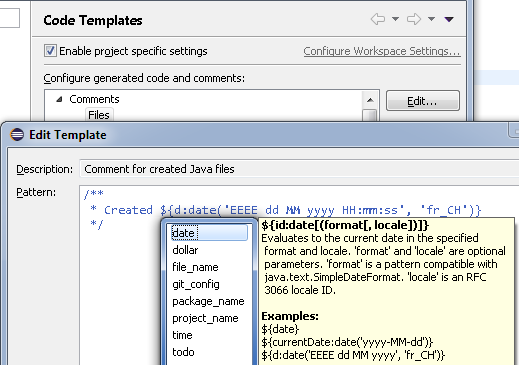 'date' template variable with custom format The 'date' variable, supported in editor and code templates, now allows you to specify which format to use when inserting the current date (or time). 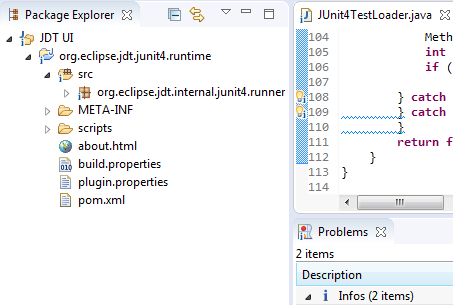 Problem decorator for Info severity A new decorator ( ) has been added to indicate information severity problems detected by the Eclipse Java Compiler. 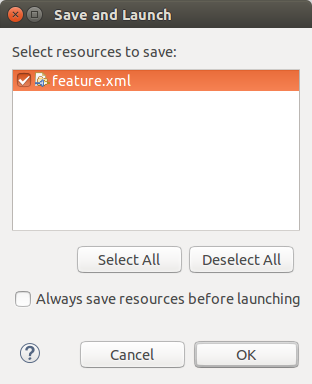 Product launch prompts for unsaved features In case you have an unsaved feature included in your product configuration file, PDE will prompt you to save it before the launch. API to get the structured selection The org.eclipse.ui.handlers.HandlerUtil#getCurrentStructuredSelection(event) API has been added to allow easy access to an IStructuredSelection from a handler. Compared to HandlerUtil#getCurrentSelection(event) this removes the need to cast and check for null. ListenerList generified org.eclipse.core.runtime.ListenerList has been generified and now implements Iterable<E>. Due to Java type system constraints, ListenerList#getListeners() still returns Object. Clients should not only add type arguments to the ListenerList, but also convert usages of #getListeners() to an enhanced for loop, thereby taking advantage of the type-safe #iterator(). SWT Control and Custom Control Examples support setting the text direction Options to specify the text direction were added to the SWT Control and Custom Control Examples. 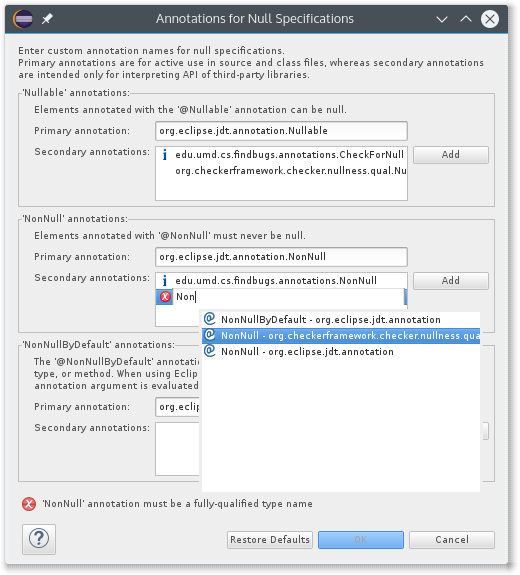 Support for the AUTO text direction for SWT widgets was introduced in the Eclipse 4.6 M4 milestone.